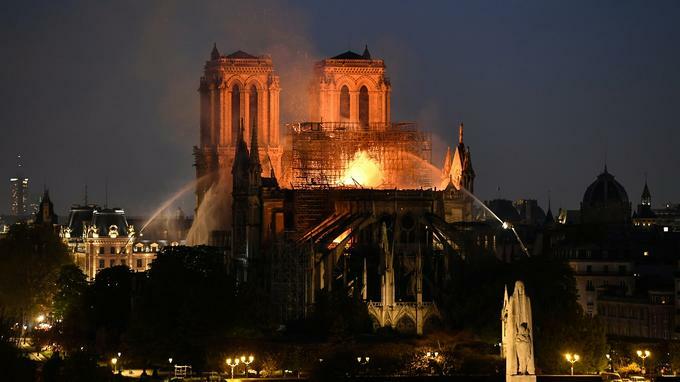 Via Fox, the "Great Bell," called "Emmanuel," is the most likely to come down. I don't want to spread fear, but while stone might be mostly impervious to fire, it won't necessarily be impervious to a very heavy copper bell smashing down into its foundations at an awful speed. I don't know what "saints sacrements" means in French but I would guess it means the holy relics of saints. Or, maybe not: I heard earlier that there were a bunch of statues of saints which had been removed to a safe location earlier, owing to the hazards of a construction project. Maybe they just mean that. I'm going to assume, though, that if they say they got out all the works of art, that includes the relics, almost always kept in reliquaries, which are themselves works of art. Update: Commenters tell me the saints sacrements are the sanctified hosts, the wafers, given at communion. Ah. The Crown of Thorns is, supposedly, the actual crown of thorns worn by Jesus at his Crucifixion.